This issue of China Heritage Quarterly appears at the end of a year of major commemorations, anniversaries and historical moments in China. These 'light and dark anniversaries', as we have called them, have been variously commented on in our March and June issues. This December 2009 issue, which marks the end of the fifth year of our publication, reflects on another anniversary, the death of the bibliophile and librarian Miao Quansun 繆荃孫 in 1919. Miao passed away in the year of the May Fourth demonstrations, a major turning point for modern China's New Culture Movement. The May Fourth was a period that saw the rise of a populist iconoclasm and the willful abandonment of many aspects of Chinese cultural traditions. While contemporary China claims a 'disavowal of revolution', a crude populism that was first commercialized in the 1910s and 20s retains a vital purchase on Chinese civic life. Miao Quansun died ninety years ago, in December 1919, and as we were preparing this issue an old friend and beloved mentor, Yang Xianyi 楊憲益, passed away in Beijing. He was ninety-four years old. The guest editor of this issue, Duncan Campbell, writes of the legacy of Miao Quansun, a man who helped create China's modern libraries and a man for whom learning was reflected in a life of reading, as well as the collecting and sharing of books. In the Features section of this issue Duncan presents further accounts by the collector Wei Li 韋力 of his search for the country's old private libraries (cangshu lou 藏書樓). Don Cohn, a translator, writer, traveller and book buyer reflects on his adventures, and misadventures, in the book markets of Reform Era China, while Huang Shang 黃裳, the modern-day collector and book writer speaks of how one book in his private collection survived the Cultural Revolution. In the new T'ien Hsia section we reproduce a number of articles related to books, libraries and collecting that were published in the pages of that journal some seventy years ago, while in Articles the Sinologist, educator and novelist Pierre Ryckmans (Simon Leys) reflects on the dangers of industrial-scale language teaching during the recent 'China boom'. A new chapter from The Rings of Beijing introduces a Han supremacist and a reprinted work by Carrington L. Goodrich reflects the racial tensions during the Ming-Qing transition. New Scholarship contains a report on a fascinating conference on the seventeenth-century Polish Jesuits Michał Boym, Jan Mikołaj Smogulecki and Andrzej Rudomina held in Kraków, Poland, in late September this year. In National Ceremonies, research notes by the editor and Sang Ye, we describe some preliminary work on the background of new state rituals in Qufu 曲阜, Shandong province, and Shaoxing 紹興, Zhejiang, which are part of 'national commemorative ceremonies', elements of China's state-sanctioned intangible cultural heritage. The issue concludes with an envoi to 2009, a year of commemorations: Gloria and Michael Davies review the film The Founding of a Republic, a mock-historical epic produced to celebrate the sixtieth anniversary of China's People's Republic. In conclusion, I would note that this year marks another anniversary, one relevant to this journal and its home at The Australian National University. The date 13 December 2009 marked the centenary of the signing into law of the Seat of Government Acceptance Act. 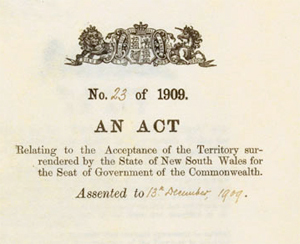 This act saw the state of New South Wales surrender land for the creation of the Australian Capital Territory, the location of the city of Canberra and what would be the new nation's political centre. The territory shares two historical connections with China, both of which relate also to its neighbour Japan. One of the reasons that the new parliament decided to create an inland capital for the Commonwealth of Australia was to better protect the city from potential attack from the sea. A particular fear was the Japanese Imperial Navy, which had only recently proved its ability in assaulting the coastal defences of Port Arthur (Lüshun 旅順) in the Liaodong Peninsula during the Russo-Japanese War of 1904-05. Secondly, the city plans for Canberra, created by Chicago architects Walter Burley Griffin and Marion Mahony Griffin, are said to have subsequently inspired an imitation in the latter-day planning of the 'imperial city' of Xinjing 新京 (formerly Changchun 長春), the capital of Manchukuo 滿州國 from 1932 to 1945. As ever, I am deeply grateful to Jude Shanahan for her patient and well-humoured collaboration in producing this issue of China Heritage Quarterly, and to Daniel Sanderson and Janos Batten for their work scanning illustrations and texts. The year 2009 is one replete with commemorative moments for China, some of which have been publicly, indeed lavishly, celebrated in the People's Republic of China and throughout the Sinophone world, others of which have been consigned to the black holes of deliberate forgetfulness—the yin and the yang of public memory. That issue and the one that followed in June this year provided insights into the many and often conflicting resonances of dates such as 1919, 1949, 1959, 1969, 1979, and 1989. 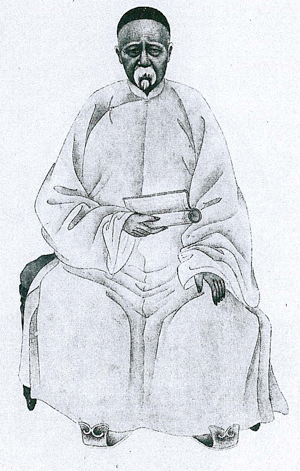 A portrait of Miao Quansun. The present issue, dedicated to the Heritage of Books, Collections, and Libraries, is also occasioned by an event worthy of commemoration but one which seems likely to slip by with little note: the death in Shanghai in late December 1919 of the important Qing-dynasty historian, bibliographer and book collector, Miao Quansun 繆荃孫 (1844-1919). Late in his life, Miao, a long-time associate of the noted reformer Zhang Zhidong 張之洞 (1837-1909) and the putative author of Zhang's influential bibliographical primer Bibliographical Questions Answered (Shumu dawen 書目答問, 1875), served as the founding director of the two most important early modern libraries in China: in 1906, the Jiangnan tushuguan 江南圖書館 (later also known as Nanjing guoxue tushuguan 南京國學圖書館 and the Jiangsu shengli guoxue tushuguan 江蘇省立國學圖書館) and, in 1909, the Jingshi tushuguan 京師圖書館 (later known as the Guoli Beijing tushuguan 國立北京圖書館). In this capacity, Miao oversaw, in the case of the first post, the transfer into public hands of the book collection assembled by the Hangzhou bibliophile Ding Bing 丁丙 (1832-1899), and in the case of the latter, the compilation of the first catalogue of the rare books holdings of what is now one of the world's great libraries, the National Library of China, which celebrated its centenary this year (http://www.nlc.gov.cn/en/indexen.htm). Ever since the change of dynasty, I have lived in retirement in that corner of the empire beside the sea; one by one all my finest imprints and oldest manuscripts have been sold for rice. Having experienced such difficult times, my enthusiasm for collecting dissipated somewhat, but nonetheless, whenever I encountered a book that brought joy to my heart and the price seemed appropriate, I would acquire it with money otherwise destined to pay for clothing or for food. Although such books would disappear through my hands almost as soon as I acquired them, like grains of sand, as I had once possessed them, however briefly, they could all be added to the catalogue of my collection, this being a far superior procedure than that of the book collectors of the Daoguang 道光 (1821-50) and Xianfeng 咸豐 (1851-61) reign periods, none of whom would ever allow a single character from their collections to escape into the public domain. The history of the library, in both China and the West, is a very long one, Laozi after all served as Archivist (Zhuxiashi 柱下史), a post that we would nowadays call 'librarian'. But ancient libraries and modern libraries are, by nature, two entirely different institutions. Ancient libraries were simply places to store books (古代圖書館不過是藏書的地方) and those in charge of them were no more than guardians of the books they contained, their duties fully discharged to the extent that they prevented those books from suffering damage. The modern library, by contrast, is a research institute, its librarians working not just to protect and store books but to ensure the greatest possible use of these books in all their variety. The library is thus, in nature, educational.. This view of the Chinese library has proven particularly influential for, despite all their critical importance in any account of late-imperial intellectual developments, the library, in particular the private library, has fared badly in contemporary accounts of these institutions. Writers and historians tend largely to restrict themselves to the consideration of only the bibliographical or antiquarian dimensions of the topic or else they consign the entire pre-modern history of the various types of Chinese library to a brief introductory section of their work intended to illustrate the absolute rupture between the modern and the traditional library. In this context, the traditional private library, or 'cangshu lou' 藏書樓, (in choosing this translation I am consciously resisting the tendency to understand them merely as 'book repositories'), and the habits of mind and practises of management associated over time with cangshu lou, is characterised as being inadequate from a number of perspectives. Broadly summarised, champions of the modern 'westernised' library are critical of the pre-Republican cangshu lou and they comment negatively in particular on the limited use to which books were put in the past and, secondly, on the restricted access that people had to such collections. That is to say, historians of the modern library make too easily the claim that late-imperial Chinese reading habits were overly determined by the needs of the imperial examination system and that private book collections were closed to all but family members or close associates of the collector. In Chinese, this particular view of the history of the private library has been most forcibly asserted by Wu Xi 吳晞 in his short but influential interpretive history, Cong cangshu lou dao tushuguan 從藏書樓到圖書館, the title of which, in keeping with that author's reasoning, can only be translated as From Book Repositories to Libraries, and in the preliminaries in which he argues that these institutions represent 'two entirely different things, the natures of which were entirely dissimilar' (兩種性質截然不同之事物). 'The old-style Chinese book repository', Wu goes on to say, 'lacked entirely the facility that would allow it to develop and evolve into the modern library; this essential lack being the element of an openness to society, and thus it could not become the progenitor of the new-style library' (中國的舊式藏書樓中缺乏進化演變成為近代圖書館的基本機製，主要是缺少面向社會開放的因素). Wu's particular concern seems to be that there remains no misapprehension about the origins of the modern library in China: 'China's libraries were the product of the introduction of Western thought and culture into China; the history of the Chinese library only begins with the acceptance of Western library science and management practices'. To his mind, the recognition of the 'imported' nature of the institution is historiogaphically critical: 'Only once we demarcate the Chinese library as having been born after the creation of modern society is research into the history of Chinese libraries lent a clarity and distinction of both scope and direction' (如果將中國圖書館的產生界定在近代社會之後，就會使中國圖書館史的研究有了一箇清晰明确的范疇和塗徑). In this issue of China Heritage Quarterly we reject the apathetic cast of mind that would cast the traditional libraries of China into the (already crowded) dustbin of history. We do so by presenting a number of perspectives on the book, collecting and libraries in China. In the new T'ien Hsia section we republish three important early articles by K.T. Wu ('The Chinese Book', 'Colour Printing in the Ming Dynasty', and 'Chêng Ch'iao, A Pioneer in Library Methods') published over seventy years ago, along with V.L. Wong's 'Libraries and Book-Collecting in China from the Epoch of the Five Dynasties to the End of Ch'ing'. To remind us of the extent to which traditional habits of book collecting have proven both resilient, even in the most difficult or unusual of circumstances, in Features we offer Huang Shang's 黃裳 essay on the one book (by the Manchu garden historian Chuin Tung) returned to him after he had been dispossessed of his library (we also include in T'ien Hsia also Chuin Tung's 'Chinese Gardens, Especially in Kiangsu and Chejiang'). We also take great pleasure in publishing a memoir by an extraordinary contemporary collector of the Chinese book (and all other manner of print and published material), Don Cohn. The title page of Lotus Fragrances Gathered Together (Ouxiang lingshi 藕香零拾). Also in Features we publish some further items from the contemporary Chinese book collector Wei Li's 韋力 archaeological quest to uncover traces of the libraries of old, again concentrating upon those to be found in Changshu 常熟, a town that, in the late-imperial period, developed strong and particular traditions of book collecting. As Wei Li argues in the 'Preface' to his book, a translation of which was published in China Heritage Quarterly, Issue 18 (June 2009), see http://www.chinaheritagequarterly.org/scholarship.php?searchterm=018_oldlibraries.inc&issue=018: 'I then find myself thinking… of all the rare books housed in the major libraries throughout our land. We all admire the splendid holdings of these institutions; few give even a passing thought to the generations of book collector whose painstaking efforts have made these books available to us, to those bibliophiles of old who have passed on to us the torch of learning. Of Miao Quansun it may be said that his life was one lived for and through books, as collector, author, editor, publisher and, late in life, librarian. In rethinking the physical and ideological genealogy of the 'modern' Chinese library at a moment in time when so many 'traditional' aspects of China's material culture and associated habits of mind are being revived, reconsidered and reinvented, it is appropriate that we commemorate the death, some seven short months after the heady days of the May Fourth demonstrations, of a man who devoted himself to the bridging of traditions rather than to their abandonment. He was a man devoted to the preservation of the products of China's long and rich print culture. In his efforts, Miao was fully cognisant both of the various failings of traditional habits of book collecting and of the dangers posed by such practices. He was; nonetheless, convinced of the need to maintain the best aspects of these traditions. …developed a simple and convenient method to ensure the circulation of books, as follows: Each book collector should examine the book catalogues of other collectors and make note of those books listed therein that they do not themselves possess, listing first works from the Canon and its commentarial tradition, then works of history and lost records, then literary collections, and finally miscellaneous anecdotes. In cases where the books required happen to belong to the same categories, are of similar temporal provenance and are of roughly equivalent size, an agreement can be struck whereby the owners of the respective volumes will order the works in question carefully copied and proofread before, with the period of a month or so, the copies will be exchanged between the two libraries. This method promises a number of distinct advantages: First, good books are never required to leave the libraries to which they belong. Second, we perform a meritorious deed in relation to the ancients. Third, one's own collection grows daily richer. Fourth, books from the north and the south intermingle and circulate freely. 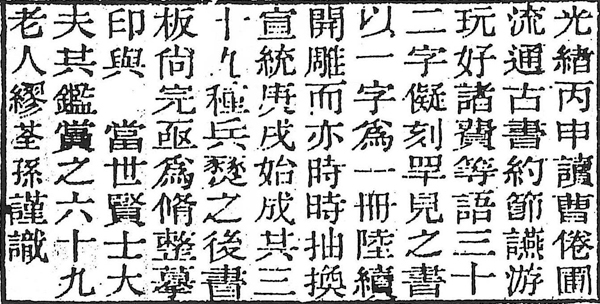 Cao Rong's 'Covenant for the Circulation of Ancient Books' (Liutong gushu yue 流通古书约). When I was serving in the Metropolitan Library I came to know an eminent man who had in his possession a treasured autograph manuscript of his father's writings that he kept stored away in his book trunks. Whenever anybody happened to enquire about it he would always reply that he still had the MS and that he had long intended to have it printed. Whenever anybody asked to be allowed to borrow it in order to have it copied, he would always reply that, once he had had it printed, he would be sure to give a copy to his interlocutor, thus saving them the trouble of having it copied. Whenever anybody offered to have it printed for him, however, he would invariably reply that he could not abrogate his own responsibility in this respect and entrust the task to others. Sadly, after he died the MS disappeared. It wasn't that he did not understand the need to treasure and preserve the MS, but it was simply the case that he did not have a plan whereby he would be able to ensured its preservation and circulation. This is precisely what Cao Rong warns us about here. As I recount this story, I heave a deep sigh of regret. As the century unfolded, and China's wealth of printed culture suffered from what some would later call a 'book holocaust' or shu jie 書劫, Miao's sigh of resignation would be chorused by the despair of many who love books. This text was produced under working title Catalogue of Books Newly Acquired by the Hall of the Breeze of Literature (Yifeng Tang xin shou shumu 藝風堂新收書目), but it was ultimately given the title A Record of the Book Collection of the Master of the Hall of The Breeze of Literature: A Further Continuation (Yifeng Tang cangshu zaixu ji 藝風堂藏書再續集). It remained unfinished at the time of Miao's death. Li Dazhao, 'Speech at the Commemorative Meeting Celebrating the 2nd Anniversary of the Establishment of the Library of the Beijing Tertiary Normal College' (Zai Beijing gaodeng shifan xuexiao tushuguan er zhounian jinianhui shang de yanshuoci 在北京高等師范學校圖書館二周年紀念會上的演說辭], Pingmin jiaoyu 平民教育, 1919 (10). Wu Xi, whose work I discuss below, speaks of the history of the private library in China as having suffered a 'rupture' (中斷) due to the arrival of the modern period: '…the private library (cangshulou 藏書樓) became extinct; they were certainly not transformed into something else'. See, for example, Jinhong Tang, 'Educational Reform and the Emergence of Modern Libraries in China with Special Reference to the Metropolitan Library of Beijing, 1909-1937', PhD diss., University of Western Sydney, 2004. Patricia Herbert, 'From SHUKU to TUSHUGUAN: An Historical Overview of the Organisation and Function of Libraries in China', Papers in Far Eastern History (1980, 22: 93-121) too, although never explicitly addressing the term, concludes that: '…the library in imperial China was primarily a repository of traditional learning and culture' (p.120). The term presently used for 'library' in Chinese, tushuguan 圖書館, was first employed in 1896, having enjoyed a history of usage in Japan prior to that. From 1903 onwards, this term replaced the older words used previously in all official documents. For which, see Cong cangshu lou dao tushuguan (Beijing: Beijing tushuguan chubanshe, 1996), p.1. Cong cangshu lou dao tushuguan, p.2. Cong cangshu lou dao tushuguan, p.3. Cong cangshu lou dao tushuguan, p.4. 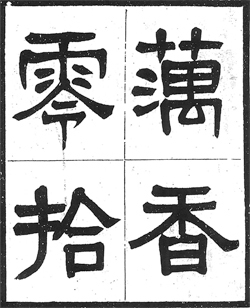 For which, see Miao Quansun, comp., Ouxiang lingshi (1910; rpt. Beijing: Zhonghua shuju, 1999), p.25. Miao arranges the contents of this miscellaneous collection in accordance with the words from a sentence contained in Cao Rong's covenant. This term was first used in reference to the First Emperor of Qin's infamous 'burning of the books and burial alive of the scholars' (fen shu keng ru 焚書坑儒) from 213 BCE onwards. For a recent general treatment of this event, including a discussion of doubts about its historical veracity, see Matthew Battles, Library: An Unquiet History (New York & London: W.W. Norton, 2004).